When was the last time you went on a true vacation? At the beginning of March, my partner and I had the pleasure of visiting Portland and Seattle. Portland is the kind of city you can’t really forget. We only had two days there but they’ll stay with us a long time! I want you to have as great of a time as us, so here’s my personal guide to Portland, OR! After relaxing most of the first day, we went out for an elegant and absolutely remarkable dinner at Tasty n Alder. This restaurant was the perfect way to celebrate our upcoming anniversary. It’s tough to put to paper the outstanding flavor and perfect cooking put into their lamb t-bone steaks! They organize their menu as shared plate dining (or small plates), so they recommend ordering four to five dishes for two people. I love new American restaurants like this because I hate only getting to taste one dish! This way we both get to discuss and enjoy an extended meal. Keep in mind that Tasty n Alder doesn’t accept reservations – during peak times, this place is busy! As we came on a weeknight, we lucky were seated right away – at the last table left in the house! You won’t regret spending your money at Tasty n Alder. When we woke up on Tuesday morning, I jumped out of bed because I was so excited to check out Fat Fancy! 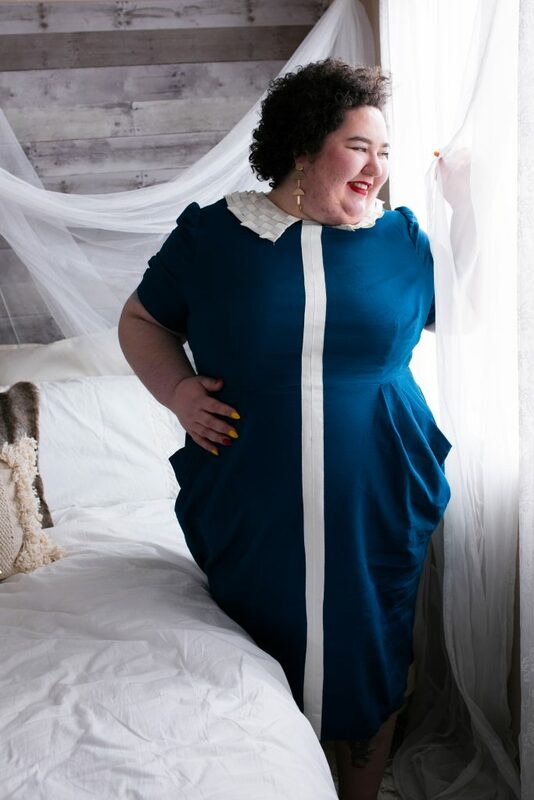 Fat Fancy is a brilliantly run plus-size resale store in Portland. I’ve been watching their live sales on Facebook for what seems like forever, and I couldn’t wait to meet the energetic, glorious owner Bee in person. When we walked into the store, my breath was taken away! This was no ordinary clothing store. It was the rainbow heaven of my dreams! Color everywhere in sizes ranging from 14 – 30+. 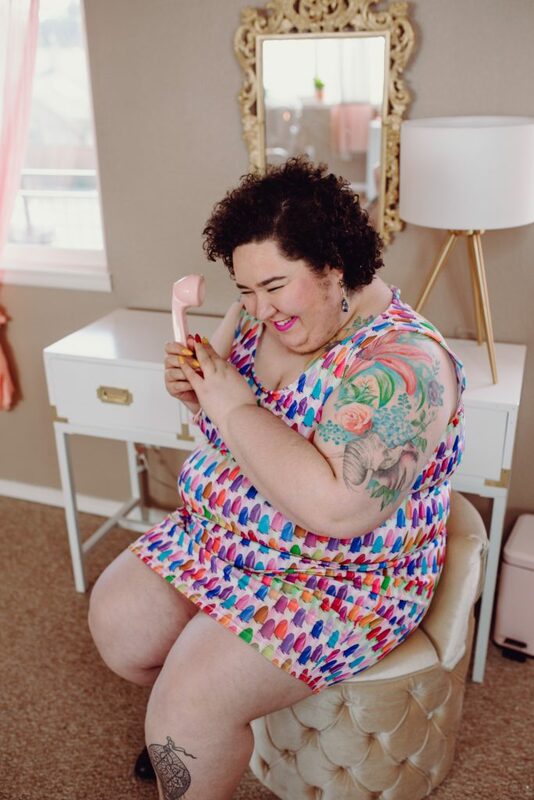 Here’s the kicker: Fat Fancy has designer plus size clothing too! They even carry clothing from Chubby Cartwheels and Fat Girl Flow. I love how it’s really a one stop shop. Bee was dressing me for my next stop in Portland, shooting with Suma Jane Dark. I picked out 5 or so complete outfits, including accessories. Fat Fancy even has shoes, boots, and graphic leggings. Boy do I regret not living in Portland after stopping here! My love – who hates shopping – went bananas! She found so many things that she loved. She ended up buying boots and cat printed leggings, but she wanted so much more, if only we had the room to take it back! I rushed out of Fat Fancy to Suma Jane Dark‘s studio for a glamorous photoshoot. Suma is a friend and a published professional photographer. 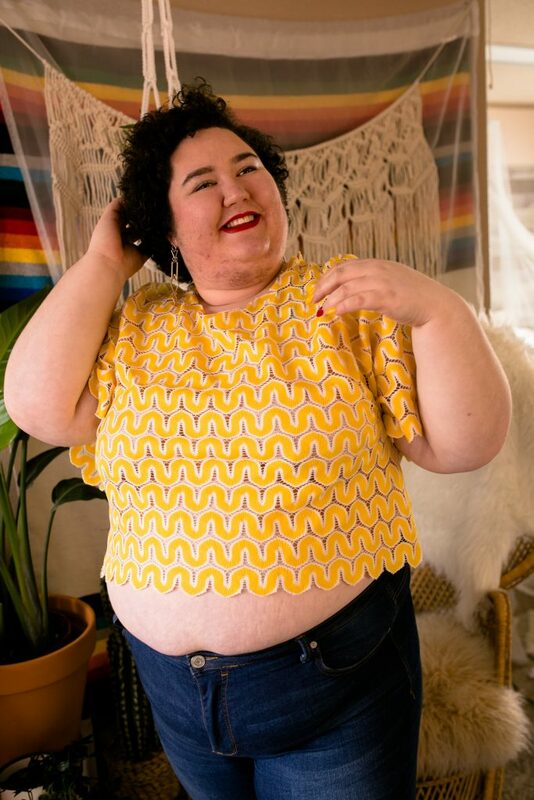 As a plus-size, non-binary babe, Suma just “gets it” when photographing fat people. They make you feel absolutely at ease as soon as you step into their beautiful styled studio. Shooting with Suma is a blast! No matter what positions they effortlessly direct you into, you’ll be laughing the entire time. It’s truly a royal experience. I know a lot of folks are so confident about boudoir, but even if getting in front of a camera at all is a big deal for you – try the experience with Suma. 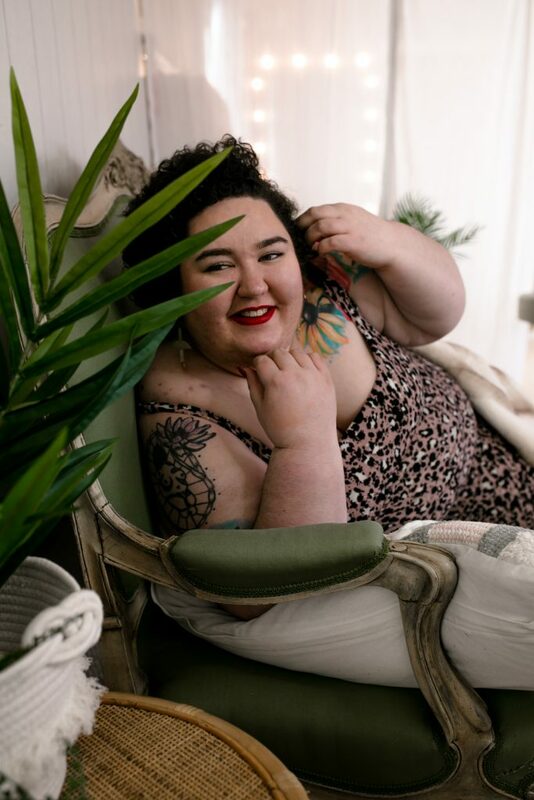 Take a peak at Suma’s website, and you’ll see all the glorious fat babes they’ve photographed. Getting my eyebrows done by Janelle. Then for a little break from the glamour and on to some self care! I headed over to The Treatment. The Treatment is a stunning, brightly-lit spa in Portland. 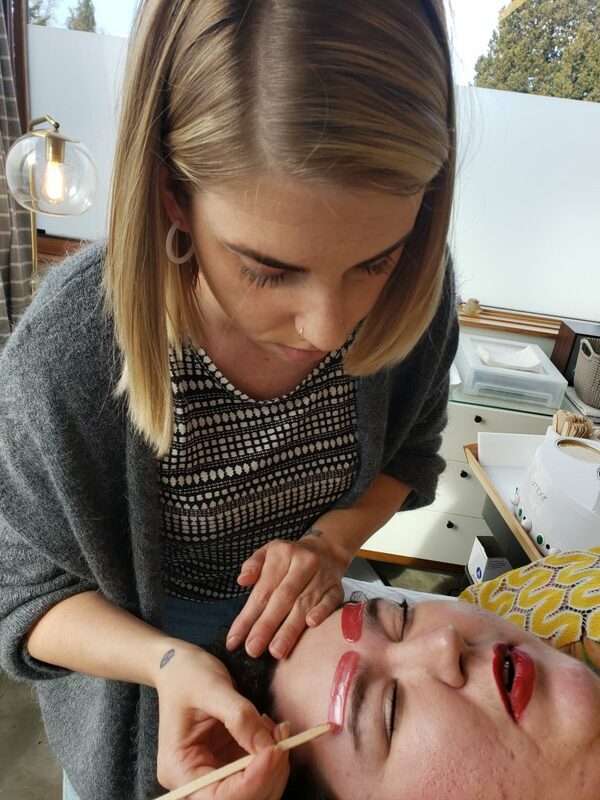 The esthetician Janelle specializes in skin and waxing services. Getting a proper wax as a fat person can be so hard! I love how welcoming and kind Janelle was to my partner and I. I was scheduled for a Brazilian and Morgan for an eyebrow wax. Truth be told, I was super nervous about this for like a week before our trip! I’ve never had a Brazilian before. While I ended up chickening out, I wish I hadn’t. If anyone would make me comfortable enough as a fat woman to get this service, it was Janelle. Morgan and I both ended up getting an eyebrow shaping and wax. Janelle used a hard wax and precise deft handiwork to create beautifully shaped brows. We both left thrilled with the experience! After brows, we hung out with Suma and their three dogs, got some dinner, and then off to the finale – donuts. Before I let my Instagram followers know that I was headed to Portland, I had NO idea that it was a city known for donuts. Now, I don’t love donuts, but I do love sweets, so I had to see for myself what all the fuss was about. Enter: Voodoo Donuts’ maple bacon donut. 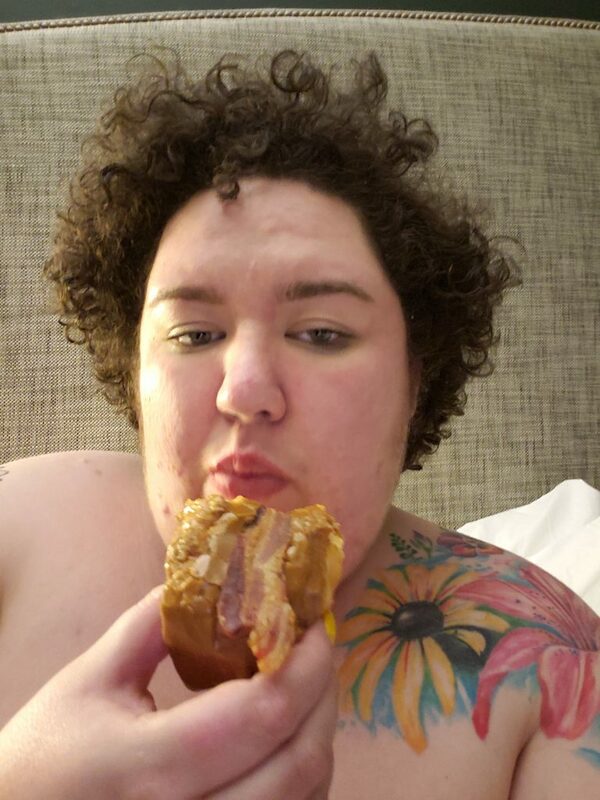 I took a selfie halfway through eating the donut hoping that you could see the expression of pure pleasure on my face! This was the absolute best donut I had ever had the pleasure of eating. It was the perfect way to end a perfect day. For those of you with dairy restrictions or who are vegan – Voodoo Donuts have not forgotten you, either! I look forward to sharing more of my travels with you. Exploring new cities is one of my favorite pastimes, and one of the only ways I turn my brain off and really relax.